4 Responses to Homeopathy is not helpful for depression – on the contrary, it depresses me! And entirely typical of the genre. It really is time we moved on. The first study was published in 2011 and the second in 2015. I charge that journal editors are to blame for lax, misleading, even fraudulent standards. While I agree with your conclusions that the trials that you have detailed do not support the hypothesis that homeopathic treatment is effective for depression, or that it is equivalent to the SSRI’s used as controls, I am not sure that I agree with all of the points that you have made. A great many clinical trials do not have a placebo group, but instead compare the new treatment with the current standard of care. Depending on the circumstances it might be unethical to deny the control group an established treatment that is known to work. Certainly it makes recruitment at lot easier if the subjects know that they will all be receiving treatment. For instance, supposing that you have a new hormonal drug and you want to test its efficacy in preventing the recurrence of breast cancer, then it would be normal to test it against an existing drug such as tamoxifen, which is known to be effective. As you correctly point out, the lack of a statistically significant difference between the outcomes is not proof of non-inferiority. A non-inferiority trial needs to be set up from the beginning as such, which includes deciding in advance what the threshold for non-inferiority should be and calculating the sample size that will show this with a given level of significance; generally large numbers are required for this sort of trial. In the trials you have detailed, the only thing that the claims of non-inferiority idemonstrate is that the authors don’t understand the statistical tests that they are using. To say that the trial is not blinded because the subjects can tell which group they are in from the side-effects they report could probably be applied to almost any trial of an effective treatment. We know that drugs and other interventions powerful enough to have desired effects also have undesirable effects, and indeed this is one of the things that all good clinical trials record. It is rather unusual for toxicities to be the same in treatment and control groups. However, generally the subjects are not sufficiently well-acquainted with the drugs in question to know what to look for, and there is also the nocebo effect to consider. Even if the person assessing the toxicity in a given patient forms their own view of which arm they are in, really it is only apparent at the time of analysis what is going on. The dermatological symptoms that you mention (hives – i.e. urticaria, itching and rashes) are very common, and restlessness and inability to sit still are frequent features of agitated depression, and I don’t think that in themselves they would be a giveaway in an individual patient. I wonder if you could clarify something? 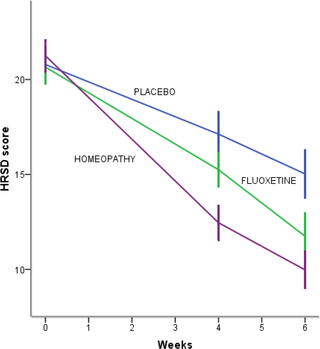 In the first study, when the authors state that more patients randomised to homeopathy were excluded due to worsening depression, does that mean that they were not included in the analysis? If so, that makes a nonsense of the whole trial, as the analysis should have been on an intent-to-treat basis (i.e. which group they were randomised to) not on the basis of what treatment they actually received (which would introduce bias). I completely agree with Richard Rawlins that these failings should be picked up by the journal editors and the peer review process before the trials are ever published. I know that of course, yet I object to the review-authors calling it placebo-controlled. that’s why the success of blinding ought to be checked in such trials. this is not entirely clear from the paper. Seeing this exchange is heartening. Two professionals who know their subjects and hone Words for clarity provides far more access for this layman to understand. Thank you both. One professional “challenged” by a charlatan generates a confused exchange where the latter relies on befuddlement to sneak their assertion through.